And you want all this for free, then there is a service just made for your. UltraVPN is a client/server SSL VPN solution based on OpenVPN. It encrypts and anonymizes your network connection. UltraVPN is a simple user interface to connect or disconnect to a VPN server. UltraVPN is easy to install, easy to use. 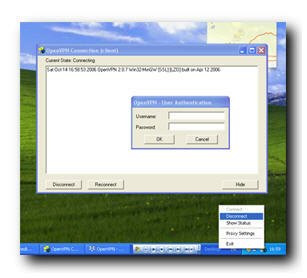 It is a cross-platform client, which supports a large number of encryption scheme. THe best part is that it is open source and free to use. Its servers are based in France and so you are given an IP based in France for your Internet connections. I found the browsing fast enough for similar services. You just need to download the free VPN client software from their website and install on your machine. Don’t worry, the software is open source and free from Spyware and other malware. Obtain a username and password, and start using it. Good to know to someone offer free VPN services. I will test it now. Ultra vpn is in fact spyware designed by the Chinese clique with the aim of locating people in China that are looking for a VPN to bypass them blocking the internet. Once you download it they are into your computer and monitor and record everything you do, apart from the obvious that the ultra vpn does not even achieve what it claims to do. This is the best free VPN I came across while I was in China. Very fast and reliable. UltraVPN provides a free OpenVPN with the standard off the shelf Open source configuration. The protocol is enabled by the OS of your computer as UltraVPN does not provide any software of its own so it’s not user friendly. UltraVPN has a tiny network of servers (France and USA) with no server switching and one IP! The standard OpenVPN application does not protect against the dropping of your internet connection (and is therefore highly insecure) and is missing all the basic features. UltraVPN’s stated privacy sounds good but as a French company with French servers, appearances may prove deceptive. The recent enforcement of the French Law Hadopi has internet users deeply concerned as to how to comply with the law and not be spied on by the French government. The parent company of UltraVPN, Lynanda, is a French company that creates software to log and report Skype traffic for corporations and governments (dictatorships). Lynanda writes it provides “A universal software able to detect and filter Skype and P2P traffic”. The French Law is clearly at odds with UltraVPN and it’s odd that Lynanda would be in such a business unless they were already compliant with French Law. There is something amiss here and we think that Lynanda is providing this free service for a price. The price may be that your data goes to the French government (who share everything with the Americans or vice versa as they only have a server in the USA). I would stay away from this one. I live in Beijing so I always rely on VPN to surf the net. VPNs are used to secure your internet connection. It helps access blocked sites such as Hulu. UltraVPN has been troubled by connection problems in some countries, mostly by “server certificate…” error message. In my country first, connection was refused immediately, now certificate, TLS handshake and other messages fill the error log file. Similar problems are seen in some openVPN type softwares too. i m in OMAN (UAE), here skype is blocked i cant access my skype account please can any one tell me that what i can do for access! where can i find username and password? OpenVPN very good, but hard for me to setup. Right now am using http://www.highspeedvpn.com/, I like it is very easy to use. I had big problems with some OpenVPN a while ago. I haven’t used free vpn,but I must try on.. seems to me that it is good! I need Username and password program ultravpn . I would like to share this program with you. After trying this software I think that I have to share it. It also unblock the Skype, Paltalk and everything. You can use it on your cellphone. I think you have to try it.